You might have seen the television commercial from Royal Canin touting the differences between Labrador Retrievers and Golden Retrievers and their breed specific pet foods addressing those differences. Are there any breed specific pet foods or is this marketing? 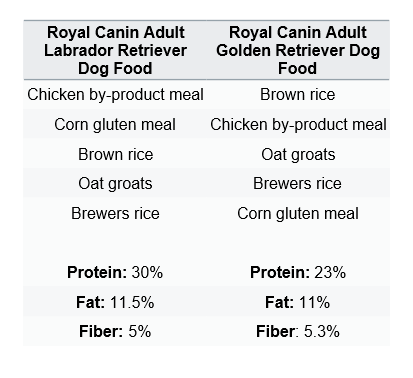 The YouTube video of Royal Canin’s commercial leads consumers to believe that a breed specific pet food for Labrador Retrievers differs from a breed specific pet food for Golden Retrievers; “Because precise nutrition can transform your pet into a magnificent animal.” Is there such a thing as “precise nutrition” for our pets? “Precise nutrition”…let’s look at that. The first five ingredients are identical in both foods, just in a different order. 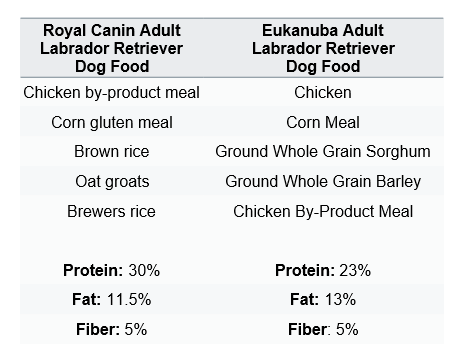 The Labrador dog food has a significantly higher protein percentage, but fat and fiber are similar. Is this precise nutrition specific to these two breeds? Giving Royal Canin the benefit of the doubt, let’s assume the above dog foods are indeed ‘precise nutrition’ for a Labrador and ‘precise nutrition’ for a Golden Retriever. 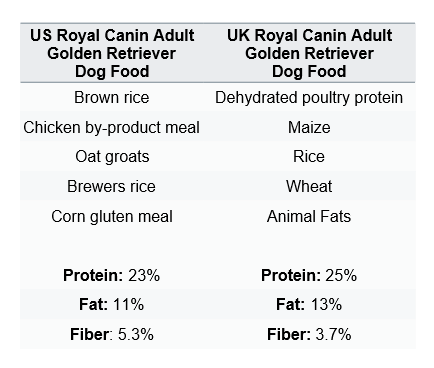 Going with this assumption, why is the Royal Canin Adult Golden Retriever dog food sold in the UK different ‘precise nutrition’ than the US version? The first five ingredients are significantly different in the two Golden Retriever dog foods, protein and fat is higher in the UK dog food. Wouldn’t ‘precise nutrition’ be the same for Golden Retrievers all over the world? ‘Precise nutrition’ for one Mars pet food specific to Labrador Retrievers consists of 30% protein, but breed specific nutrition for the same dog in another Mars pet food consists of 23% protein – dramatically different nutrition. We find different ingredients, different protein, fat and fiber percentages in the three dog foods – all specific to one breed, all manufactured by the same company (Mars Petcare). Is this breed specific nutrition or is it breed specific marketing? What a surprise! (not). 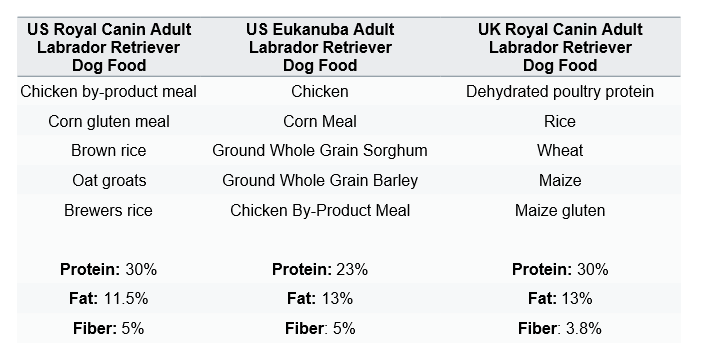 Well, any way you slice them, these Mars Royal Canin/Eukanuba breed-specific foods –aside form being misleadingly marketed– are pretty crappy, mainly byproducts and assorted grain. There are so many better products out there, probably much cheaper as well than these; I wonder why anybody buys this crap to begin with!! Keep educating consumers!! I took a lot of heat in my food blog for criticizing Royal Canin’s urinary care Cat food, giving my opinion that it’s overpriced (considering its almost entirely grain based formula) and more of a marketing gimmick than an adequate food treatment. Thanks for posting this. It gives me reassurance that i’m not crazy. And since cats are obligate carnivores, any grain is a waste if not actually toxic to cats. Dogs can’t digest grain either; remember the old days when they used sawdust in dog food? It was probably better than the moldy GMO grains they use now. I was once a very naive pet parent & believed all this BS that was pushed on me. I was even buying the breed specific food for Labradors. Once the recalls hit, I started to do research (lots of it) & couldn’t believe what I found. I was innocently feeding my dog (& other dogs in the past) commercial pet food. I would just pick any of them…….I mean, these are made specifically for dogs so it has to be good for them, right? Please. I didn’t like any of what I found in my research so I started to home cook & never looked back. I also “preach” to all my friends about the dangers of commercial pet food. I think that’s shameful because many people are still believing as I once did & buying into all the hype. To see you break it down to prove that it is nothing but hype only reinforces what I have believed since 2007. I’m so sorry for all the animals that got very sick or died but I was lucky. I was feeding the same thing everyone else was but somehow or another, my dog managed to stay healthy. Sure opened my eyes tho……. Can I say that the acronym for “breed specific” is BS? Excellent, glad someone finally exposed the absurdity of pet food marketing. And, sad that so many pet owners ‘buy into that’ chicanery and blatant obfuscation, all fueled by corporate greed as you’ve so correctly exposed time and time again. Thanks. The whole “breed specific” ad campaign struck me as idiotic from the first time I heard it. Very interesting article, I was at my local Petsmart shopping for a few items and saw the Royal Canin Rep display table with like 20 different Royal canin dog and cat kibbles and all of the kibbles were shaped differently. So, I guess without comparing the ingredients side by side of the different breeds you would then be led to believe that each bag is designed just for that pet’s nutrition. On another despicable and sad pet feed note – COSTCO is currently selling 55 pound bags of Pedigree for about $12. I saw someone with 5 bags stuffed in their cart! Why don’t we have race specific foods for humans? It is arrant nonsense. The idea that I should befeeding my tabby cat and Siamese cat different foods is laughable. Apart from them having their own persoanl preferences, like the Siamese has “gone off” salmon at the moment after years of eating it, they both get yhe same home-prepared food based on chicken, fish, offal and vegetables intended for humans. Next it will be different foods depending on whether they are black labs or golden labs, blue point Siamese or Seal point. I mean where does this end? The really sad part is that a lot of the vets believe in all this snake oil hype. This kind of marketing is such nonsense! How dis dogs manage without humans to micromanage their diet for thousands of years! I can just imagine them wandering through the hunting grounds with their check list of ingredients they must consume each day! Animals need a very basic number of elements in order to live healthy and NONE of them need processing that turn them into a hard dry overly processed substance that rots out their teeth or needs synthetic China processed vitamins to replace any true nutrients that have been processed out. The FDA must receive kick backs from these companies to allow such blatant lies in advertising! Obviously the UK is not as aware of the no gluten or wheat in diets being discussed widely in the US. It’s all marketing except maybe the large breed vs small breed puppy and that’s mostly because people can’t judge how much to feed their animals. Actually, the large breed vs small breed puppy is significant. Large breed puppies have different calcium and protein needs since they should not grow too quickly. An interesting fact from one of my vet tech nutrition courses! First off, you’re wring about the first statement. Since large breeds don’t live as smaller breeds, they will experience rapid. That’s why you need keep a couple in of things. However, telling someone to watch out for calcium and protein levels is kind of erroneous. Even though you should calcium levels in mind to prevent joint problems, you need to watch out the phosphorous levels and number of calories. On another note, while nutrition courses provide information, it always helps to fact check what you’re learning. I say that because, there’s no evidence to suggest that high protein contributes to skeletal disease in large breed dogs. 5.Lauten SD, Nutritional Risks to Large Breed Dogs: From Weaning to the Geriatric Years, Vet Clin Small Anim 36 (2006) 1348. In UK, regulations seem to be tougher and are enforced (whenever a supplier is caught – checking isn’ t continuous). Ingredients lists also have to be in order: greatest quantitities first. But we still get breed-specific cat and dog foods. WOW! I am feeding my boxers the Royal Canin Boxer breed food! Healthy coats, no skin issues, No gas! I have been feeding my babies this since they were puppies! Best food for the breed in my opinion and everyone here is only giving their OWN opinion! Even though I’ll agree that some people are just giving their opinion. However, most are using facts to back up their claims. It seems as though you’re glossing over that fact, because it’s working fine for your dogs. Don’t get me wrong. That’s always good to hear. Just don’t turn to a snob. All of our pets are fine… Until that fateful day – they aren’t. With proper diet, Cats tend to live longer lives compared with most pups, yet drop dead at alarming rates at around the age of eight, the victim of renal failure, etc. from eating moisture depleted (kibble) diets full of non-animal sourced protein. And of course dogs the world over are constantly being chased out of the corn and rice crops – otherwise gorging themselves! I don’t think so. Find the video:. Pet FooLEd on Amazon and be prepared to lose your own appetite. Even when I didn’t know that much about pet food, I thought that breed specific formulas were hogwash. I knew that dogs are individuals with differences. However, I didn’t think those were so significant as to warrant food based on breeds. On top of that, most of the companies that produce that food used awful ingredients. So far, Best Breed’s is the one brand that seem decent. On another note, I found that commercial so silly I couldn’t see it as serious. At first, I watched it at 360p. When I realized the quality I had it set on, I attempted to increase it. It adjusted to 720p at the end. So, I replayed it. It still seemed to have bad special effects. As the owner of Golden Oasis,Llc retrievers-this ad has bothered me for its misleading approach. ( btw my education is in marketing) Thank you for the comparisons for the consumer. If it isn’t difficult enough to find quality food for both human and animal alike-dog food manufacturers could get on the band wagon and start truly educating. Be more considered with by products and fillers. Thank you for your awareness.